1.0 joule electric fence energizer plug-in kit. 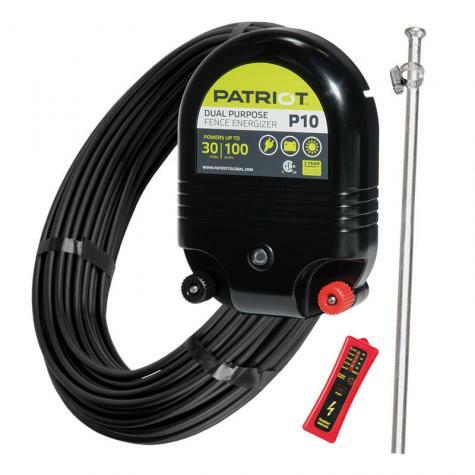 Connect to an outlet and carry the pulse to the fence line via the supplied insulated cable. 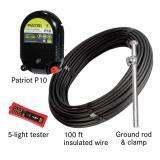 The Patriot P10 can be mounted either inside or outside of a building, but not where there is risk of fire. The energizer must be mounted vertically. Protect the energizer from direct rainfall. This was the first time for me to ever install an electric fence and if I can do it, ANYONE can! It was easy to set up (only took me a couple of hours for a few acres) with the included instructions and within 2 days my horses learned to not rub against the wooden fence anymore. This was a great alternative to replacing most of our disintegrating wood post& pole fence, the tuffring screw-in insulators where a breeze to screw in. I will be purchasing more supplies to outfit my other pasture with this fence and just move the energizer. Wish I had installed this years ago!